TIBET CONSCIOUSNESS – QUANTUM PHYSICS – THE CONCEPT OF EMPTINESS. DALAI LAMA SPEAKING AT THE CONFERENCE ON QUANTUM PHYSICS. PHYSICS CANNOT ACCOUNT FOR THE EXPERIENCE OF TASTE SENSATION IMPARTED BY SALT, SODIUM CHLORIDE, A CHEMICAL COMPOUND. Quantum Physics plays no role in understanding reality of ‘Consciousness’ which has both Subjective and Objective basis to verify its existence. Quantum Physics encounters a problem in accounting for true nature of ‘LIGHT’ due to Wave vs Particle Dualism. To the same extent, Quantum Physics encounters a problem to account for Subjective and Objective Reality of Man’s existence in physical universe. The condition called Existence can only be experienced by things which have structural and functional complexity. Particles can exist but cannot experience condition of their own existence unless and until they get incorporated into higher levels of structural and functional organization which is displayed by large molecules called polymers. To explain this, I may use the analogy of experiencing taste sensation imparted by Salt or Sodium Chloride. This sensation can never, ever be experienced from verifying reality of its constituent Chemical Elements, Sodium, and Chlorine. Only a Chemical Compound called Salt is associated with Saltiness. Atoms of Sodium or Chlorine and their subatomic particles cannot account for such experience; and it serves no purpose by bringing into discussion the concept of Emptiness or Sunyata. For there is a fundamental division or separation of animate and inanimate matter, the study of Quantum Physics belongs to the realm of Inanimate or Non-Living Matter. The Concept of Emptiness or “SUNYATA” shared by Acharya Nagarjuna has to be interpreted by Biology and not by using principles of Physical Science like Quantum Physics. It should not be of any surprise if Physics and Chemistry fail to account for Buddha’s ‘Enlightenment’ whether it is real or not. As such I have to state that Quantum Physics cannot verify or account for ‘TIBET CONSCIOUSNESS’, reality of my Subjective and Objective Existence in Physical World. TIBET CONSCIOUSNESS – QUANTUM PHYSICS – THE CONCEPT OF SUNYATA OR EMPTINESS. DANIEL OBERHAUS, AUTHOR OF STORY ON QUANTUM PHYSICS CONFERENCE. TIBET CONSCIOUSNESS – QUANTUM PHYSICS – THE CONCEPT OF SUNYATA OR EMPTINESS. QUANTUM PHYSICS CANNOT VERIFY OR ACCOUNT FOR TIBET CONSCIOUSNESS. Ever since Copernicus published On the Revolutions of the Heavenly Spheres in 1543 to outline his heliocentric cosmology and thereby kick-start modern scientific inquiry, an uneasy truce has existed between science and religion. Although Copernicus wasn’t persecuted for his views by the dominant religious authorities (in fact,Pope Clement VII expressed great interest in Copernicus’s work, and the latter would end up dedicating his Revolutions to Pope Paul III), his intellectual heir Galileo was not so lucky when he faced down the Roman Inquisition in 1633, a testament to the fragility of this philosophical truce. This either/or approach to the world, where one considers phenomena through either a scientific or religious lens, has colored scientific inquiry ever since Galileo was placed under house arrest for his heretical (but scientifically accurate) views. Its legacy can still be seen today in the vehement spats between religiously motivated climate deniers and the militaristic guardians of science known as the New Atheists. Yet what if there was a different approach to the world, which didn’t require planting oneself firmly in either the science or religion camp? This was the question posed by Tenzin Gyatso, the 14th Dalai Lama, as he presided over a two day conference on quantum physics and Madhyamaka philosophy in New Delhi last week. And according to His Holiness, figuring out a way to reconcile scientific and religious philosophies may prove to be essential to the future of our species. The Dalai Lama has never been a stranger to science, and throughout his tenure as Tibet’s leader in exile he has advocated for the collusion of science and Eastern philosophy (even Chairman Mao commended the Dalai Lama for his “scientific mind” directly after reminding His Holiness that “religion is poison”). 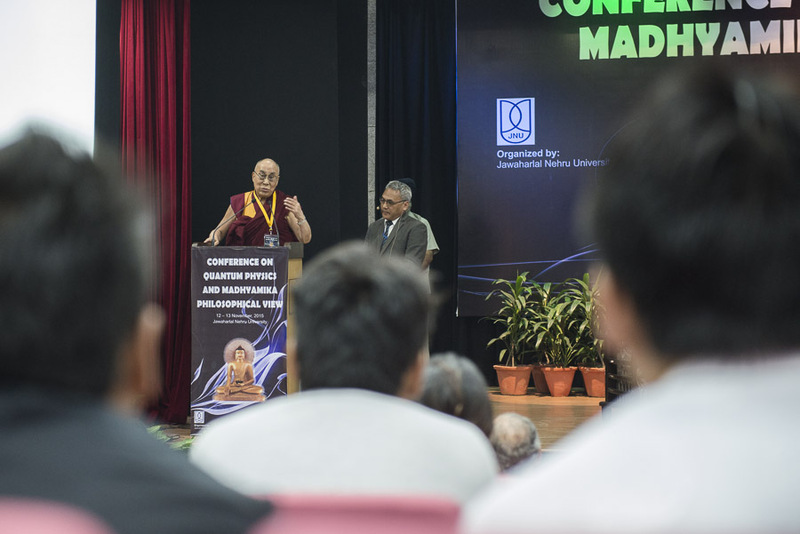 This intersection of interests was manifest in the diversity of His audience, which was comprised of roughly 150 Tibetan bhikkhus, academics, and students who had piled into the conference center at Jawaharlal Nehru University to listen to the Dalai Lama and a panel of physicists and monastic scholars discuss the intersection of quantum physics and Madhyamaka Buddhist philosophy. As the Dalai Lama noted in his opening remarks at the Delhi conference, he was only alerted to the intersection of quantum science and Madhyamaka, one of the main schools of Buddhist thought, about 20 years ago after having a discussion with the late Indian nuclear physicist Raja Ramanna. According to His Holiness, Ramanna had been reading the texts of Nagarjuna, and he was struck by just how much the ideas of this 2,000 year old Madhyamaka philosopher matched his own understanding of contemporary quantum physics. TIBET CONSCIOUSNESS – QUANTUM PHYSICS – THE CONCEPT OF SUNYATA OR EMPTINESS. IN EXPLAINING REALITY OF ‘LIGHT’, QUANTUM PHYSICS ENCOUNTERS PROBLEM OF WAVE AND PARTICLE DUALISM, TWO FUNDAMENTAL PROPERTIES OF LIGHT. SIMILARLY, QUANTUM PHYSICS CANNOT ACCOUNT FOR EXPERIENCE CALLED CONSCIOUSNESS AS IT ENCOUNTERS PROBLEM POSED BY INANIMATE – ANIMATE DUALISM. There are generally considered to be two main philosophical schools in Buddhism, known as Mahayana and Theravada. Madhyamaka (“one who holds to the middle” or “the middle way”) belongs to the Mahayana school of thought and was developed by Nagarjuna in the second century. Although a staggering number of subtly different interpretations of Nagarjuna’s philosophies have emerged in commentaries on his work over the years, a core idea uniting them all is that of emptiness. In Madhyamaka thought, all things are empty insofar as they lack any inherent essence or existence. This emptiness applies not just to people and things, but also to the analytic categories which are used to describe them. According to Nagarjuna, this emptiness is the product of the dependent origination of all things. In other words, all phenomena lack their own inherent existence because their very existence is dependent on the conditions that gave rise to them. Yet for Nagarjuna, to say that nothing has any inherent existence is not the same as saying nothing exists; it is merely to posit that nothing has a “fixed and permanent nature. In order to clarify this, Nagarjuna posited two truths: a conventional truth and an ultimate truth. In so doing, he recognized that it is possible to simultaneously perceive things as actually existing out there in the world (the conventional truth) as well as recognizing that they lack any inherent existence (the ultimate truth). Holding these two seemingly contradictory positions is only possible by recognizing that ‘reality’ is an experiential phenomenon, not one that has an objective existence independent of our experience of it. If you’re confused as to just what these ancient musings on the nature of reality have to do with contemporary quantum physics, you’re not alone. 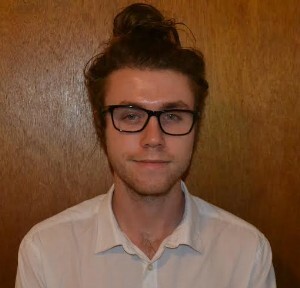 One of the most glaring examples of the intersection of Madhyamaka and quantum physics is to be found in the principle of wave-particle duality, which holds that elementary particles (fermions and bosons) can exhibit the characteristics of both particles and waves, yet can be wholly reduced to neither. Like the quantum wave function, a probability matrix used by physicists to describe the state of a system at a given time, wave-particle duality points us to one of the central problems at the heart of quantum science: is there an objective, independent reality that is capable of being quantified, or are all such measurements subjective by virtue of the fact that they are always dependent on an observer to take them, thus merely reflecting the observer’s knowledge? As Einstein and the physicists at the conference pointed out, these seemingly contradictory pictures of reality really only make sense if you take them both together: a middle way, much like the Madhyamaka philosophy. Another aspect of quantum mechanics worth mentioning is the principle of entanglement. This principle, tackled by both Einstein and Schrödinger in 1935, occurs when pairs or groups of particles are generated in such a way that the state of any given particular particle cannot be determined. Rather, the observer must measure the state of the quantum system as a whole. With an entangled system, the state of each particle is correlated with the others; therefore, measuring single particle will influence its entangled partners (what Einstein called “spooky action at a distance”), collapsing the superimposed states of the entire quantum system. To borrow from the language of Nagarjuna’s philosophy, we might say that quantum physics possesses two truths: a conventional truth (the determinate reality brought about through observation) and the ultimate truth (an indeterminate reality expressed as probabilities). These truths of quantum mechanics mirror Madhyamaka philosophy insofar as the latter professes that things do actually exist out there in the world yet have no intrinsic, objective essence and only derive their essence from our subjective interpretations. What is more, in both cases, the explanation for the two truths is remarkably similar in both quantum mechanics and Madhyamaka philosophy. In the case of quantum mechanics, entanglement is a quantifiable expression of Nagarjuna’s notion of dependent origination—the state of a particular quantum particle cannot be expressed because it is dependent on the quantum system as a whole, much like Nagarjuna’s phenomena which cannot have their own inherent essences because their existence is dependent on the conditions which brought them forth. Such were the ideas expressed over the course of the two-day conference at JNU in New Delhi. For the most part, the explicit connections between Madhyamaka and quantum physics were left up to the interpretation of the audience. The physicists stuck to physics and the monastic scholars stuck to Buddhism. Yet much like each concept itself, composed of seemingly contradictory ideas that nevertheless prove to be complimentary, His Holiness insisted on the need for both physics and philosophy in the quest to overcome ignorance and end suffering, which are arguably the main aims of Buddhism. Both science and religion have their own specific uses, but one without the other can lead to less than desirable results, to say nothing of painting an incomplete picture of reality. © 2015 Vice Media LLC. Tibet Consciousness – Quantum Physics – The Concept of Emptiness. Quantum Physics cannot account for Biological Phenomena such as experiencing taste sensation of Salt. Tibet Consciousness – Quantum Physics – The Concept of Sunyata or Emptiness. The taste of Salt cannot be discovered by Quantum Physics. TIBET CONSCIOUSNESS – QUANTUM PHYSICS – THE CONCEPT OF SUNYATA OR EMPTINESS. The study of Quantum Physics and Quantum Dynamics will not contribute to understanding of Consciousness, a characteristic of Living Things. TIBET CONSCIOUSNESS – QUANTUM PHYSICS – THE CONCEPT OF SUNYATA OR EMPTINESS. Quantum Physics cannot verify or explain Buddha’s Enlightenment. TIBET CONSCIOUSNESS – QUANTUM PHYSICS – MADHYAMAKA PHILOSOPHY. 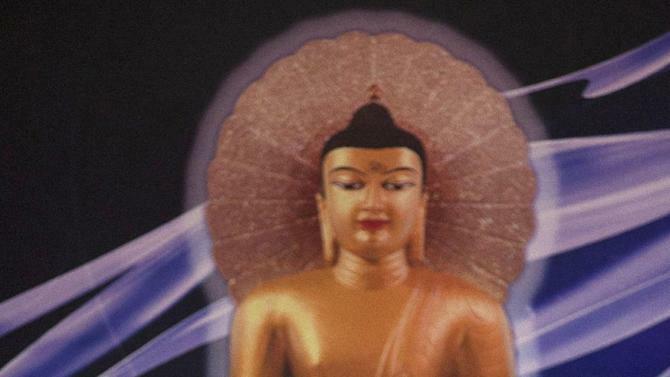 Quantum Physics cannot verify or account for Buddha’s Experience called ‘ENLIGHTENMENT’. TIBET CONSCIOUSNESS – QUANTUM PHYSICS – MADHYAMAKA PHILOSOPHY. Quantum Physics cannot explain or account for experiences that require Structural and Functional Complexity. Physics as such cannot account for Buddha’s Enlightenment. TIBET CONSCIOUSNESS – QUANTUM PHYSICS – MADHYAMAKA PHILOSOPHY. What is Life? What is Consciousness? Quantum Physics cannot study the reality of Life and Existence. 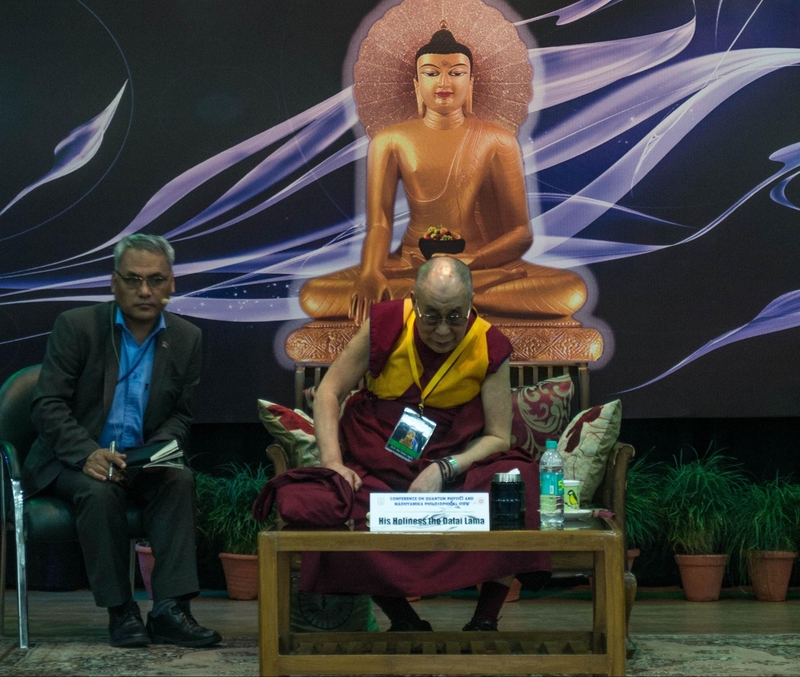 TIBET CONSCIOUSNESS AT JAWAHARLAL NEHRU UNIVERSITY, NEW DELHI ON NOVEMBER 13, 2015. Physics cannot explain reality of Life and Consciousness. TIBET CONSCIOUSNESS – QUANTUM PHYSICS – THE CONCEPT OF SUNYATA OR EMPTINESS. 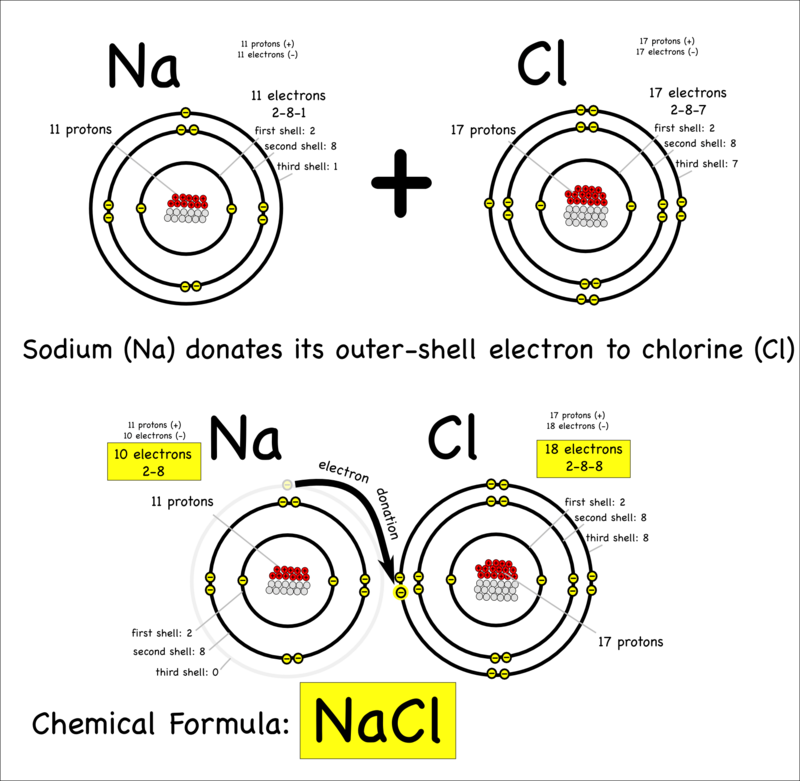 PHYSICS AND CHEMISTRY CANNOT ACCOUNT OR EXPLAIN THE EXPERIENCE OF TASTE IMPARTED BY SODIUM CHLORIDE. TIBET CONSCIOUSNESS – QUANTUM PHYSICS – THE CONCEPT OF SUNYATA OR EMPTINESS. RELIGION DOES NOT EXPLAIN REALITY USING PHYSICS OR CHEMISTRY. RELIGION IS ABOUT LIFE, AFTERLIFE, AND EVERLASTING LIFE.